Middle Ages costumes and fashion. 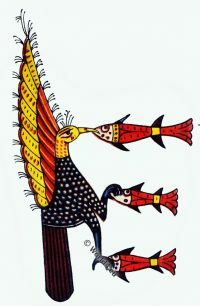 Period between 700 to 15th century. 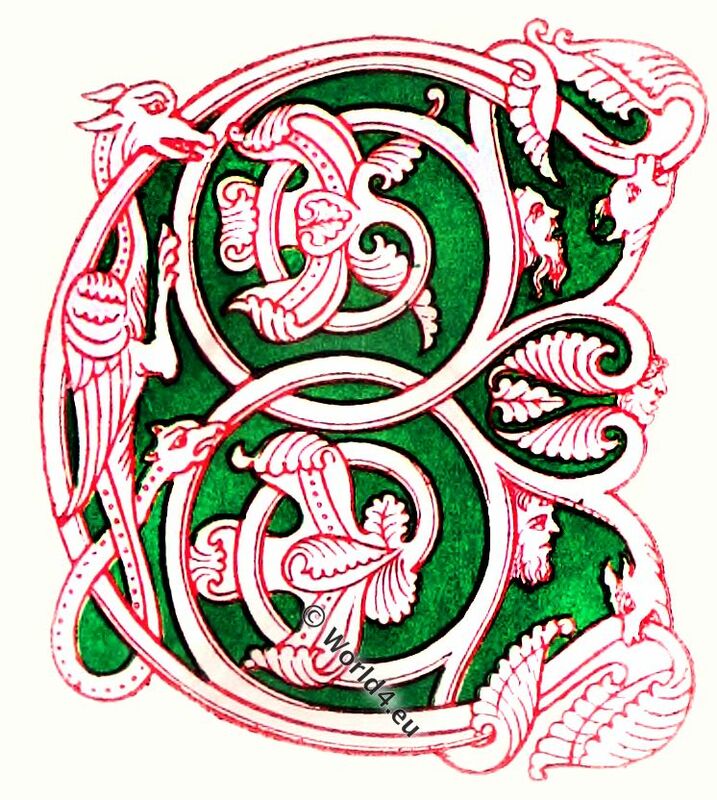 Style of Byzantine, Carolingian, Romanesque, Gothic and Renaissance. 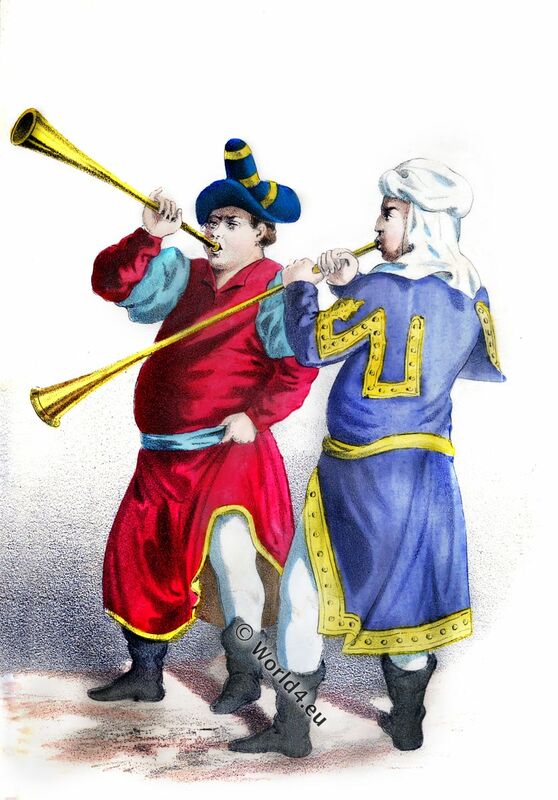 English musicians in 14th century costumes. ENGLISH MUSICIANS. 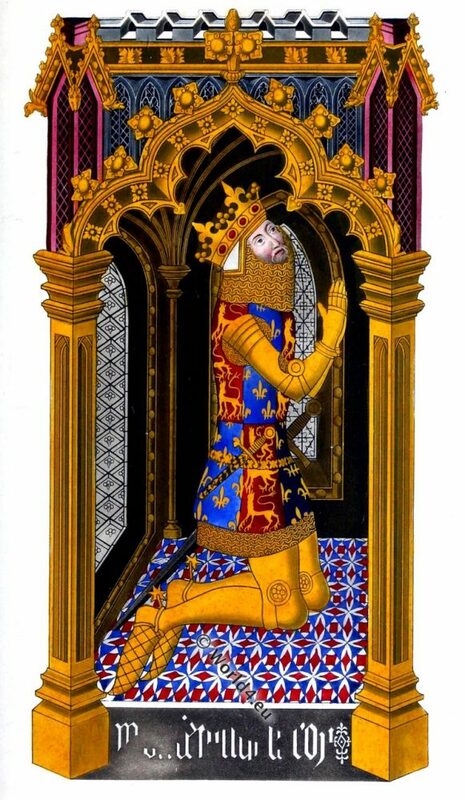 REIGN OF EDWARD III (1312-1377). This entry was posted in 1350, 14th Century, England, Middle Ages, Plantagenet and tagged Medieval costume on 3/10/17 by world4. 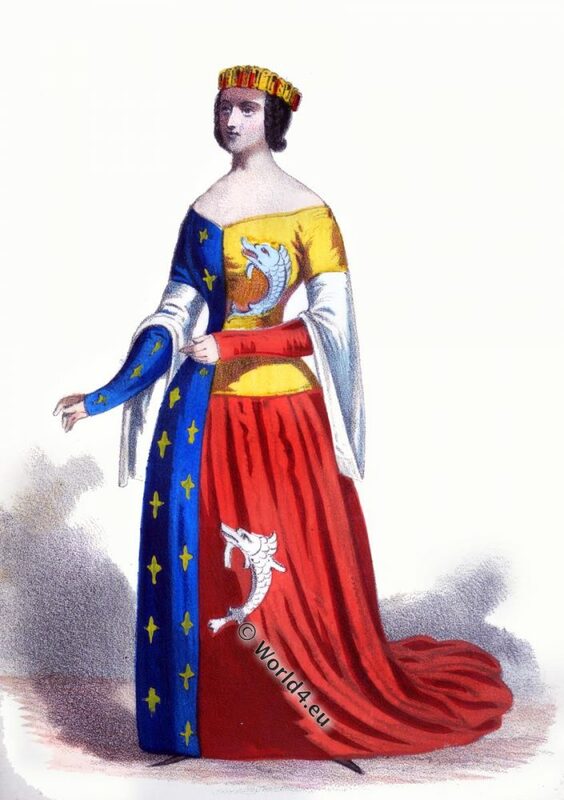 Anne Dauphine of Auvergne in armorial robe. 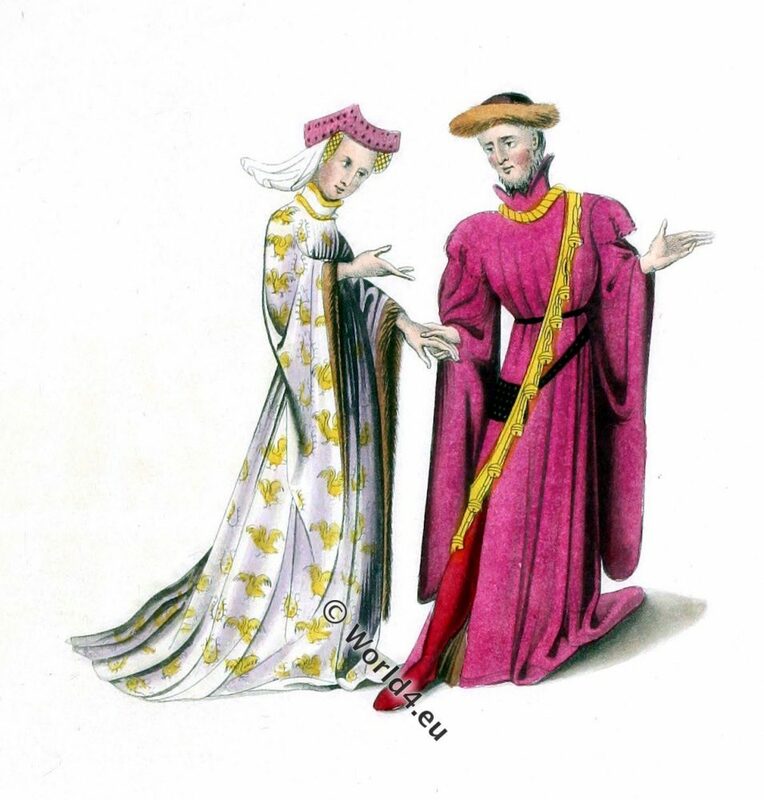 This entry was posted in 1390, 14th Century, Court dress, France, Middle Ages and tagged Medieval costume on 3/5/17 by world4. EDWARD III. 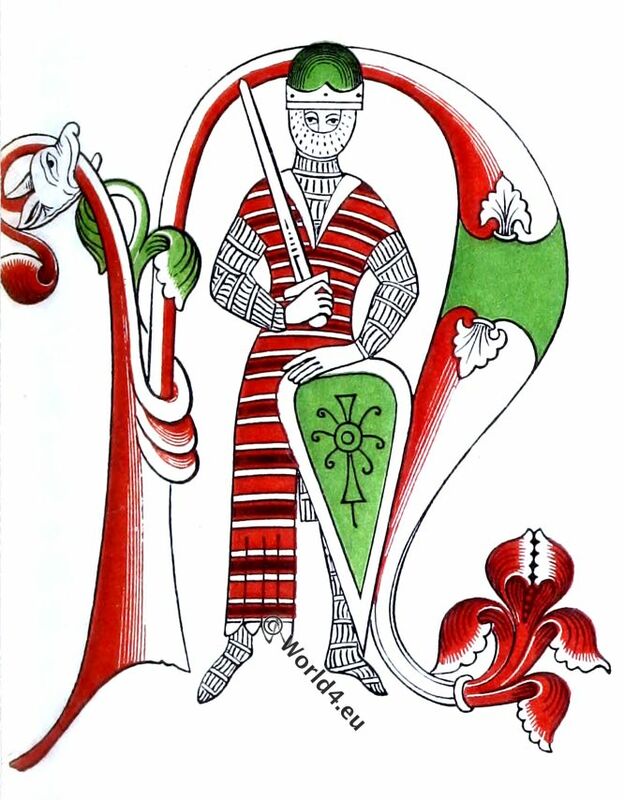 king of England and Wales, 14th century. Edward III. 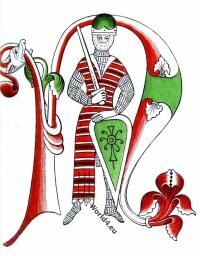 (13 November 1312 – 21 June 1377) from the Anjou Plantagenet dynasty, was king of England and Wales from 1327 to 1377 and is considered one of the most important English rulers of the Medieval times. This entry was posted in 1355, 14th Century, England, Middle Ages, Nobility, Plantagenet and tagged Henry Shaw, Medieval costume on 2/28/17 by world4. Courtiers of the time of Richard II. Courtiers of the time of Richard II. MS. Reg. 15 D. Ill, and MS. Harl. No. 1319. ABOVE all other periods in the history of England, that of the weak Richard II. was remarkable for the variety and gaiety of its fashions. The satirists and reformers of the day were zealous and loud in their outcries against the extravagance of the higher classes. This entry was posted in 14th Century, British fashion history, Court dress, England, Fashion History, Middle Ages, Nobility, Plantagenet and tagged Henry Shaw, Medieval costume on 2/20/17 by world4. 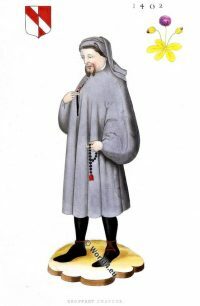 Geoffrey Chaucer. English writer and poet. 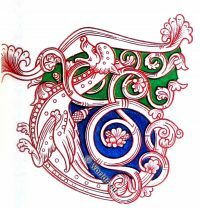 This entry was posted in 1340, 14th Century, England, Middle Ages, Plantagenet and tagged Artist, Henry Shaw, Medieval costume on 2/17/17 by world4. 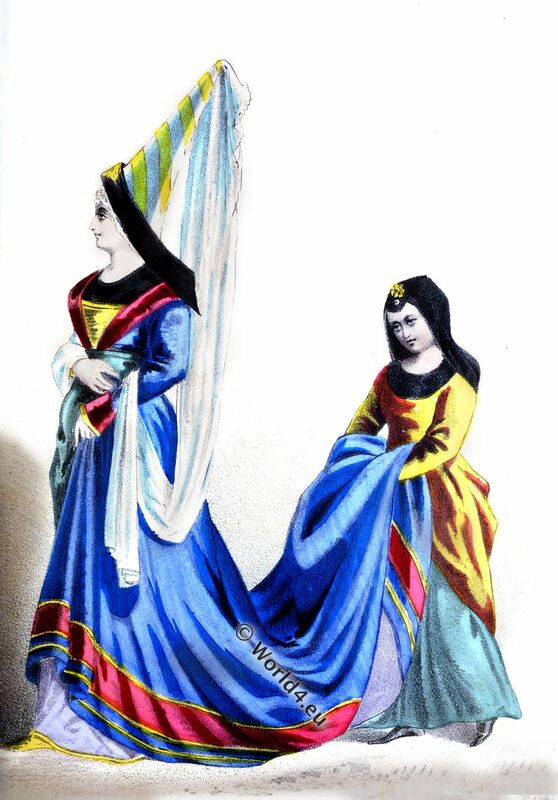 Ladies fashion of the 12th century. 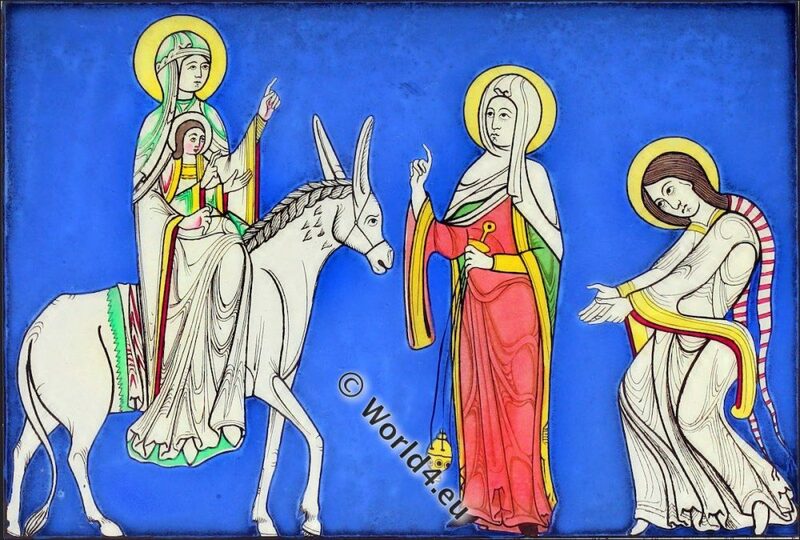 Virgin Mary on her way to Egypt. 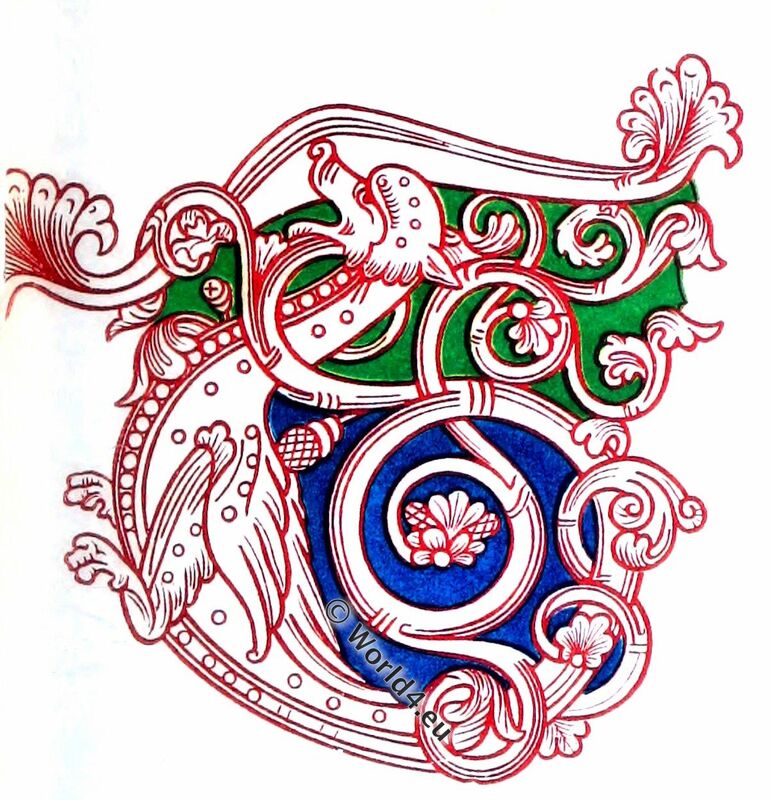 Cottonian Manuscript Nero C. IV. LADIES FASHION OF THE TWELFTH CENTURY. THE figures on the present plate are taken from different illuminations in the Cottonian Manuscript Nero C. IV. executed, probably, before the middle of the twelfth century. 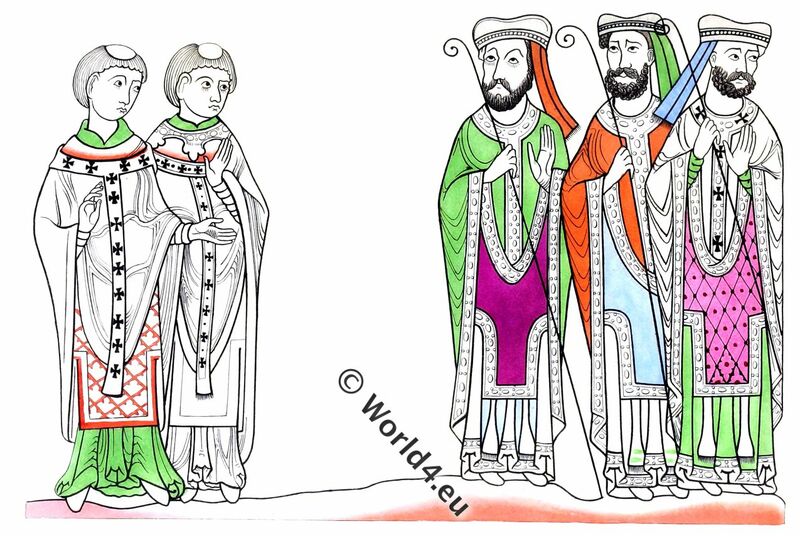 This entry was posted in 12th Century, Anglo-Saxon, British fashion history, Ecclesiastical, England, Middle Ages, Plantagenet and tagged Ecclesiastical Dress, Henry Shaw, Medieval costume, National and Domestic History of England on 2/13/17 by world4. Coronation spoon of English monarchs. 12th century. 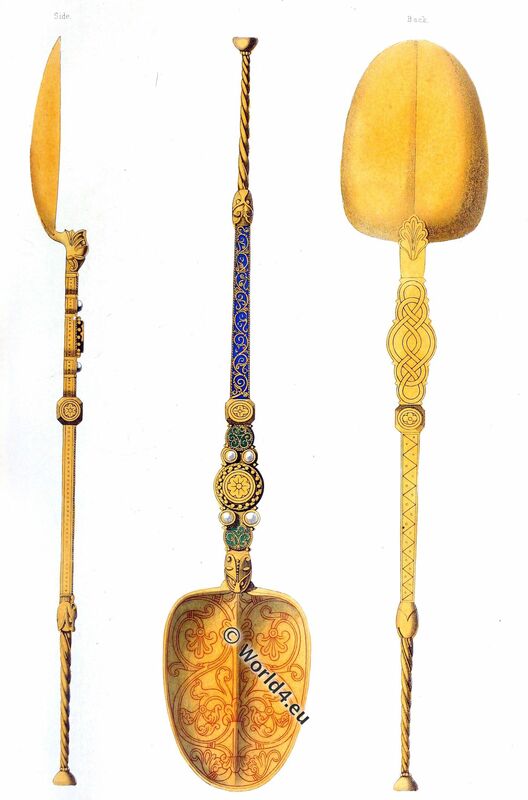 Coronation spoon of English monarchs. This entry was posted in 12th Century, 13th Century, Ecclesiastical, England, Middle Ages, Plantagenet and tagged Henry Shaw on 2/13/17 by world4. Ecclesiastics of the 12th century. Bishop, monks costumes. ECCLESIASTICS OF THE TWELFTH CENTURY. NO class of figures occurs so frequently in the illuminations of our earlier manuscripts, as those of ecclesiastics of different grades; and as the older illuminators were almost exclusively monks, we are justified in concluding that none are represented more accurately with regard to their costume and other characteristics. This entry was posted in 12th Century, Ecclesiastical, England, Middle Ages, Plantagenet and tagged Ecclesiastical Dress, Henry Shaw, Medieval costume on 2/9/17 by world4. Ecclesiastics of the cathedral of Chartres. FROM THE SCULPTURES OF THE CATHEDRAL OF CHARTRES. CHARTRES is one of the most ancient and interesting towns in France. Popular traditions carry the date of the foundation of the city back to the times of the deluge; and it has been pretended by some of the old antiquaries that its splendid cathedral stands on the site of an ancient Druidical temple. 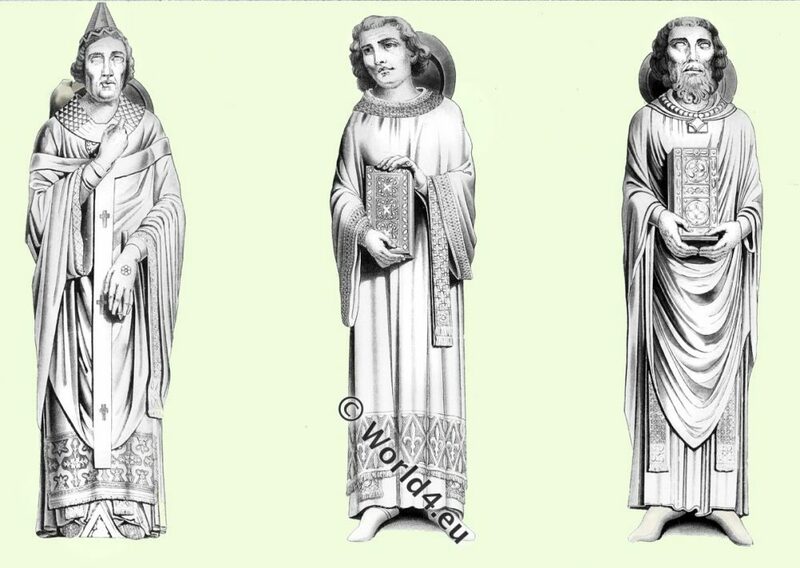 This entry was posted in 10th Century, Ecclesiastical, France, Middle Ages and tagged Ancient sculpture, Gothic costumes, Henry Shaw, Medieval costume on 2/9/17 by world4. Spanish warriors in armour, 11th century. EVERY step which we trace back in the history of the nations of Europe brings us nearer to a uniformity of costume. Fashions in dress did not begin to go through that quick vicissitude of change which characterizes modern times, till towards the thirteenth century. 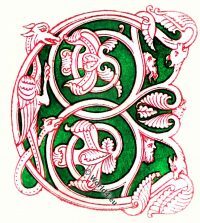 We can trace little variation in the dress of the Anglo-Saxons during the whole period of their history, and not much between that of the Anglo-Saxons and the Franks. As people became more distinctly separated from each other by national jealousies, and long and obstinate wars, the new fashions adopted in one country were more slowly communicated to another, and thus the similarity of costume becomes separated by distance of date; while some countries became so entirely estranged from each other during a long period, that the resemblance of costume and the simultaneous variation was altogether lost. 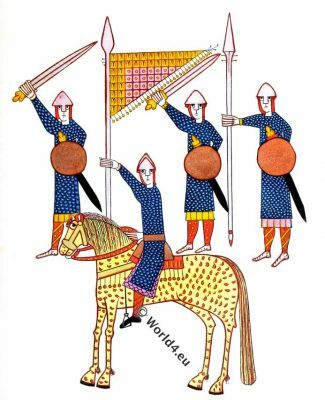 This entry was posted in 11th Century, 12th Century, Anglo-Saxon, Middle Ages, Military, Spain and tagged Henry Shaw, Medieval costume on 2/5/17 by world4.